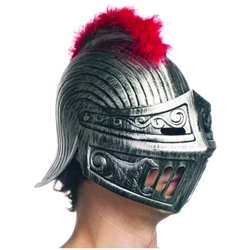 Dark metallic tone plastic knight helmet with red marabou feather trim along the comb. Helmet is one size fits most and features an adjustable visor. Made of hard plastic. Knights have long been a part of history and their looks changing based on both their century. This helmet is designed after an early 16th century burgonet helmet with a buffe visor. Please Note: The visor raises up, but will not stay up without being held in place.